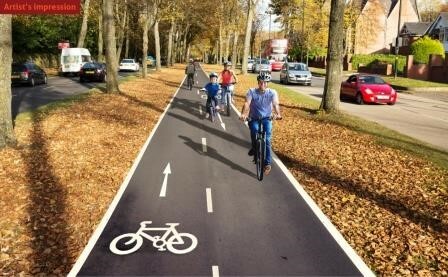 Jonathan Horsfall reports that the next phase of Birmingham Cycle Revolution (BCR) will focus on developing segregated cycle routes along the A38 between Birmingham city centre and Selly Oak and the A34 between the city centre and Perry Barr. Develop cycle loan and hire schemes to make it easier for people to get started. project is supported by the Big Birmingham Bikes programme of free bikes, cycle training, and activities with employers, schools and communities to encourage cycling. Councillor Stewart Stacey, Cabinet Member for Transport and Roads at Birmingham City Council, says that rather than focussing on schemes which rely primarily on painted lines and signage, the council is looking at the creation of routes which will enable cyclists to use these roads while completely segregated from other traffic. The Department for Transport has provided the funding. 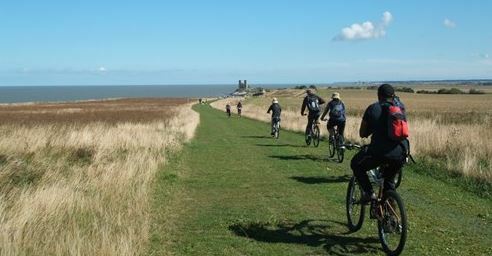 In 1983, the charity Sustrans was founded and the writer became a member. However, when it was granted £43.5 million from the Millennium Lottery Fund in 1995 and chose to spend this on leisure tracks (such as Canterbury above) she resigned. It is good to see that their policies are now more down-to-earth and include safe routes to stations and schools. Birmingham Council is to be congratulated on its clearsighted decision. Finally something will be done. It is so dangerous in parts pf Birmingham, to ride a bike.